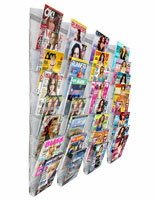 These Literature Storage Displays are Wire Magazine Racks that Wall-Mount! 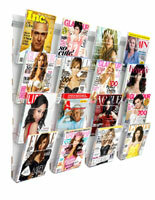 Browse a Huge Selections of Catalog Holders here! (21) Pockets for storing several stacks of 8-1/2" x 11" material. 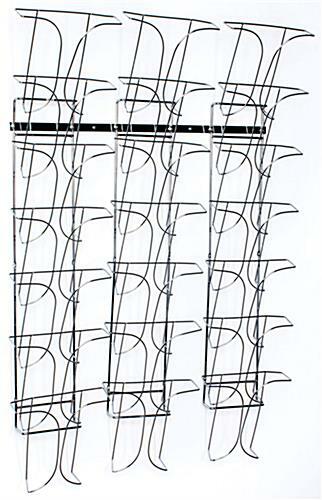 Literature storage racks have a wire construction for durability. Chrome finish coordinates seamlessly with any environment. Literature storage racks come with hardware for wall mounting. Vertically stacked, tiered arrangement of pockets is space efficient. 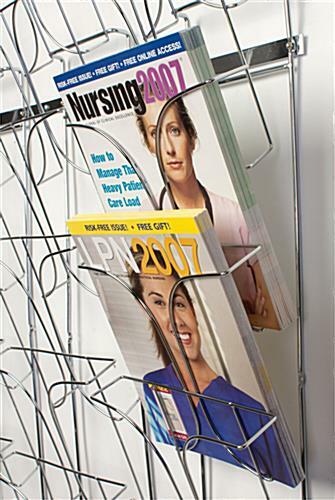 These literature storage racks that have a metal wire construction are less expensive, more durable, and more stylish than brochure holders made from other materials. 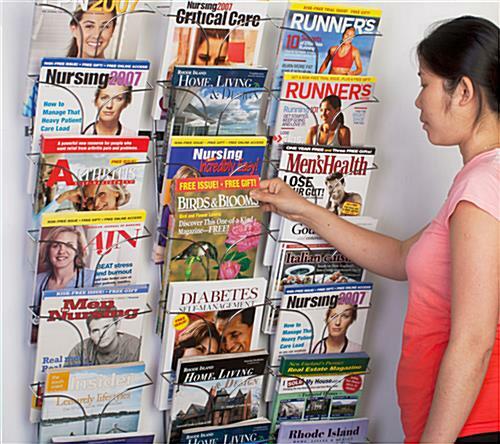 Businesses such as banks, bookstores and medical offices favor wire displays for exhibiting reading material because they are very cost-effective. 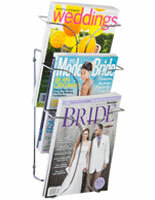 These literature storage racks that are inexpensive balance an affordable price with a lightweight and stylish design. Another benefit to the wire construction of this item is that the top half of each pocket is fully visible. This allows viewers to browse the various catalogs stored in each pocket effortlessly, without requiring them to lift the material out of the slot. 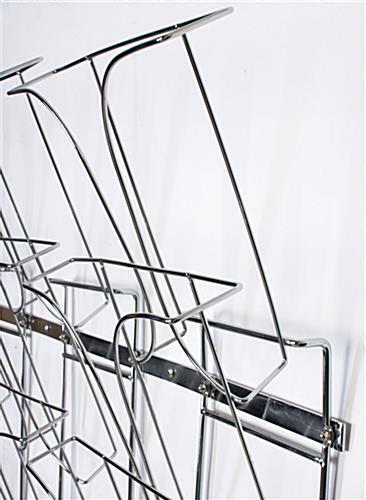 The wire literature storage racks featured on this page have a chrome finish, which coordinates with the décor of establishments ranging from a bank to a convenience store. 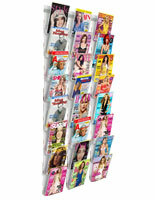 Additionally, these magazine organizers will not break or shatter when hit by a sudden impact or dropped during mounting, as a plastic unit might. 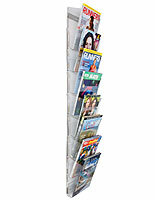 These wall mount literature storage racks feature (3) rows of pockets. Each row has (7) slots arranged in a vertically stacked, tiered configuration. 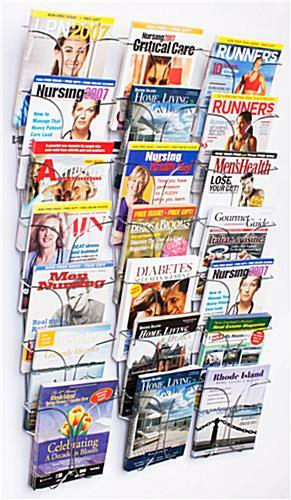 The literature storage racks that have a chrome finish are space-efficient, as the arrangement of the pockets requires minimal space. 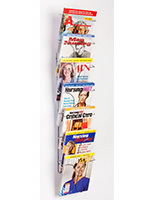 Each slot is 1-3/4" deep to hold numerous 8-1/2" x 11" catalogs. 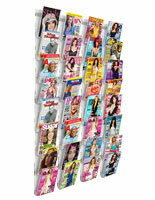 Loose sheets of paper or thick catalogs can be stored in each pocket. The pocket front is 9" high, which ensures 8-1/2" x 11" flyers will not cascade forward. There is a mounting bar attached to the back of the unit to facilitate hanging. 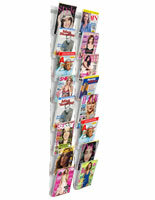 Screws and anchors are included for mounting this magazine display. 31.0" x 44.0" x 6.0"
9.5" x 9.0" x 1.8"